Both familiar and challenging, Williams' new record invites her audience to dance slow and close to a set of adult songs for adult listeners. From the stage of the Cox Capital Theatre in Macon, Georgia, on the 31st of May this year, Lucinda Williams, notorious in her early career for her sparse output, joked that she was becoming more prolific with age. She then played a mini-set of four songs from her upcoming double album that fit seamlessly into a set weighted heavily with songs from her classic, self-titled 1988 album, whose re-release she was touring to support. That 2-CD collection of 20songs, Down Where the Spirit Meets the Bone, is here now, and it presents a songwriter continuing to mature in her work, offering her fans some comfortable points of familiarity while challenging them to grow with her. In a recent New York Times Magazine essay, the influential film critic A.O. Scott declared that "[N]obody knows how to be a grown-up anymore. Adulthood as we have known it has become conceptually untenable." Scott is discussing film and television, of course, but it doesn't take a long examination of the current musical landscape to see ample parallels to his broad criticism. Never mind the continuing stranglehold of tween-centric, Auto-tuned pop and adolescent bro-country on the charts, even long-established performers continue to contort themselves into futile attempts at seeming young and remaining relevant: witness U2's recent album release publicity stunt with its cool-by-association punk icon referencing video. And if Sid Vicious' version of "My Way" being used to sell Honda Acuras isn't a demonstration of an America locked in adolescence, I don't know what is. But Lucinda Williams isn't buying it, and into this void she has released a brave, if sometimes excessive, collection of adult songs for adult listeners. 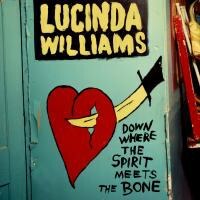 This is an album that rings with many of the familiar markings of the classic Lucinda Williams sound: the occasionally chiming guitars, the sudden, charging openings, and, of course, that voice of equal parts nectar and grit. But this is also a very different album from any that she has released. Williams presents here a collection of country soul songs referencing classic performers of that sub-genre like Bobby Gentry and Tony Joe White (who contributes his distinctive guitar tones to a couple songs here). The overall vibe is that of the second set at some late-night honky-tonk after all the necessary pairing off has been figured out for the evening and the couples just want to dance slow and close for a few more songs and a couple of last rounds. The whole of the album has a live feel to it, with most songs extending past five minutes and featuring extended instrumental breaks, often via the extended interplay between "dueling" guitars, mostly at the hands of Greg Leisz and the Wallflowers' Stuart Mathis, though Val McCallum and Bill Frisell also feature prominently on the record. Even Williams' vocalizations are especially languid on these songs, the phrasing slow, with many wavering notes held for extended fades, as if she were playing her voice like a muted trumpet. And longtime Elvis Costello collaborators Pete Thomas and Davey Faragher unseat Williams' usual rhythm section of Butch Norton and David Sutton for most of the track here, providing a loping, but never plodding, foundation for the lead players. Lyrically, Williams is in top form, and it is in her lyrics that the album's adult themes come to the fore. The record's title comes from its opening song, a reworking of a work by her father, the renowned poet Miller Williams. That song, "Compassion", sets the tone for the album's themes of maturity and grace, advising us to maintain compassion in the face of deception, rudeness, or cynicism because these are signs of weakness in the source, and because "you do not know what wars are going on / Down there where the spirit meets the bone." It's as if the Williamses, father and daughter, are offering a tonic for the lack of civility in our times. This theme of perseverance over those who would bring us down reappears throughout the album on songs like "Protection", "Cold Day in Hell", and "Walk On". The strongest statement of this theme comes in "Foolishness", which can be considered an empowering update of the classic "Changed the Locks" from Lucinda Williams. "Foolishness" follows the same blues progression of the earlier song, but here, the steel protecting Williams' persona is internal. There is no need for the locks or changed addresses of thirty years ago: Williams is herself her own fortress. She will banish all fools, liars, fear-mongers and assorted sycophants from her life, brushing all aside with the declaration "What I do in my own time / Is none of your business and all of mine". The wisdom of this song is born of 30 years in the public eye, one often dominated by male perspectives and judgments. Listening to it, I can't help but think of Taylor Swift, already five years inside the same media machine, now taking her first steps into being perceived as an adult songwriter and whose recent single, "Shake It Off" presents a confectionary pop attempt on the same theme. With any extensive collection such as this, not all of the songs work at the same level. "Burning Bridges", a more standard country-rock song, could be a Little Honey outtake and seems a bit out of place here. "Wrong Number" and "Big Mess" are fine songs that just don't stand out amidst a collection of still-stronger cuts, but that's the nature of choosing to release a 20 song double-album over a 15 song single-disc, and it's not a big deal. I'm not the first to point out that even a half-decent Lucinda Williams song trumps most of what's out there on the charts. Only "West Memphis" stumbles in its conception and presentation. Set up as a first-person reflection in the voice of one of the "West Memphis Three," the three young men wrongly convicted of the still-unsolved 1993 torture and murder of three young boys in that Arkansas town, the song falters in its narrative consistency. It works when the narrator tells the basic story, but the narrative consistency breaks down in the refrain and its repeated warning of "So don't come around here and try to mess with us / 'Cause that's the way we do things / In West Memphis." The fact is that it was outsiders whose increasing political pressure forced the local authorities to agree to a plea deal and release the wrongly convicted men makes these lines ring somewhat hollow. Perhaps voicing the narration from the perspective of a cynical but detached local observer would bring the necessary consistency to the whole of the song. In all, though, this album stands with Williams' strongest work and represents that rare thing in American popular music and its culture of celebrity: a performer who is comfortable in her own skin, even if it isn't, and hasn't been for some time, the skin of a teenager. And rare, too, in that this is a deceptively optimistic album about embracing one's place along the long and winding path of life. "Stand Right By Each Other" and "Stowaway in Your Heart" offer deep, touching appreciations of adult love, facing the obstacles and coming out the other end stronger because, sometimes, strength is making oneself vulnerable to another, opening up the defenses, and letting someone in. It is no coincidence, perhaps, that the most confident and forceful Williams sounds is on the album's gospel-tinged "Everything But the Truth": "You gotta make the most," she sings "of what equipment you've got". Amen, and, lord, she does.